Intermolecular Forces of Attraction are forces of attraction between unlike charges, partially positive and negative dipoles, that occur between two molecules. They differ from bonds in that they are not as strong and occur between two adjacent or neighboring molecules and not within the molecule itself. They do form, just like bonds, due to the attraction of opposite charges. IMFAs are typically noted with a dotted line while bonds are solid lines. Temporary or weak dipole interactions (such as those between nonmetals) in nonpolar compounds are called London or Dispersion Forces. Notice that the partially negative charge of the chlorine is attracted by a London force to the partially positive charge of the carbon of the neighboring or adjacent molecule. 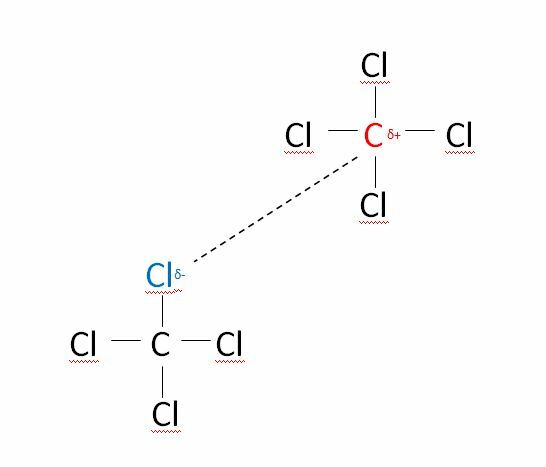 Thus, an intermolecular, or between the molecules, attraction between carbon and chlorine that helps the two molecules of carbon tetrachloride stay together. Permanent or strong dipole interactions (such as those between nonmetals) in polar compounds are called dipole-dipole interactions. This is indeed the molecular force driving the molecules to be soluble with one another and stay in solution, for example, how an solution of dilute acid is formed, when acid and water are combined. In the molecule below, the partially positive dipole of the hydrogen atom in water is attracted to partially negative dipole of the chlorine atom in the neighboring hydrochloric acid molecule. Hydrogen bonds are intermolecular forces of attraction that form between the positive dipole of a hydrogen atom of one molecule and the partially negative dipole of fluorine (F), oxygen (O), and nitrogen (N) atoms of neighboring molecules. 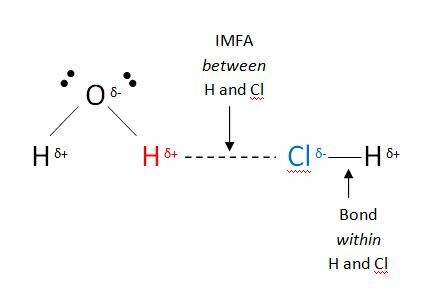 Hydrogen bonds are simply very strong and very specific dipoles, which makes them them the second-strongest intermolecular force of attraction, second to ion-dipole interactions. Their dipoles are stronger because they occur between hydrogen which has a very low electronegativity level and atoms of F, O, and N that have very high electronegativities. The disparity between the atoms’ desires to obtain electrons creates a strong force of attraction. In the molecules above, the positive dipole of hydrogen of water attracts the negative dipole of the fluorine in the next molecule. Additionally, two water molecules are held together with a hydrogen bond between the positive dipole of hydrogen of one molecule and the negative dipole of the oxygen atom of an adjacent water molecule. It feels like you’re hitting a wall when you get slapped by the water…and hydrogen bonds are responsible for creating that strong and very high surface tension. This also how some insects float on water and how drops of rain keep their rounded shape: hydrogen bonds holding those trillions of water molecules in place! A lone dipole may also interact with a single ion to form an ion-dipole interaction. 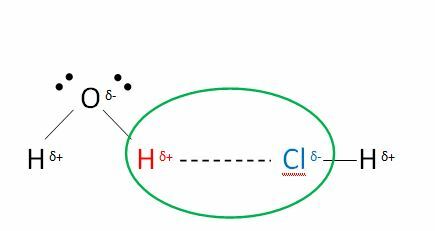 For example, the partially positive dipole of hydrogen in water as it interacts with a fully charged chloride anion. When sodium chloride, NaCl, is added to water to form a solution, the sodium and chlorine dissociate and form the Na+ cation and the Cl – anion. 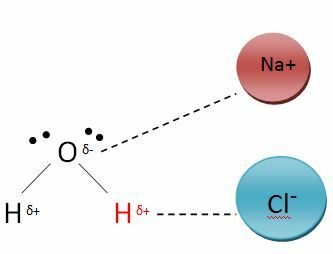 The chloride ion is then attracted to the positive dipole of hydrogen and the sodium ion is attracted to negative dipole of oxygen. Because the interaction is between a fully charged ion and a partially charged versus two partially charged dipoles, ion-dipole interactions are the strongest IMFA, even greater than hydrogen bonds.